Text and illustrations tell the story in picture story books. This type of book is especially appropriate for young children because the colorful and clear illustrations and artwork support a simple story line. The illustrations often provide additional information not covered in the text. Rhyming stories and books with repeated patterned sounds are particularly interesting to children. Picture storybooks remain children's favorite books long after their preschool years. Participation books are another type of storybook. Young children delight in being able to repeat the book's suggestions, such as clapping their hands, touching their toes, or covering their eyes. Lift-the-flap books also promote interaction. Children enjoy peeking under the flap to find the answer or make a new discovery. Concept books expand children's understanding of an idea, relationship, or theme. Patterned concept books also provide illustrated examples of various ideas and words. Books that have a strong pattern and rhythmic flow help children read along with an adult and predict what language will come next on the page. 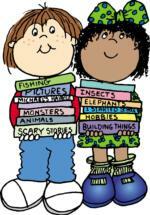 Predictable books involve children in the reading experience. The patterned language, repetitive phrases, and predictable storyline help preschoolers anticipate what is coming next. They also help children to understand language and how sentences and stories are put together. Older preschoolers will often be able to repeat elements of these stories when the book is reread, which is an important pre-reading skill. Though wordless books contain little or no text, they have a real story to tell. Readers must interpret the stories from the pictures, examining details and expressions carefully. This experience helps children focus on the sequence in the stories and give them the opportunities to use "book language." Some stories in wordless books are simple, but others are quite sophisticated and are meant for older children. The stories in these books are often the result of years of oral storytelling. Many of the stories have a moral concept or theme. Most folktales and fables have some cultural context or historical base and help children learn about diverse cultures and experiences. These stories are often ones that parents can use for storytelling without the benefits of a book. There are a variety of poetry books available for young children: collections of poems written by the same author or related to the same theme, collections of poems from multiple poets, and illustrated versions of a single poem. Each introduces the reader to the sounds of language. Rhyming poetry, especially ones with playful words, help children develop phonemic awareness. Nursery rhymes are a natural for young children. They are often recited from memory by parents or grandparents. Mother Goose rhymes are some of the most familiar, but most cultures have some form of nursery rhymes and songs that are passed down from generation to generation. Children raised on nursery rhymes will pass these tales on to their children. Alphabet or ABC books are used to help children recognize letters and realize that letters are used in language. There are a wide range of alphabet books from the most basic that show the letter and objects beginning with the letter to very sophisticated books that tell a story using the alphabet format. Creative artwork is often used to illustrate and bring new interest to the alphabet. Some alphabet books are themed and use familiar and interesting objects to highlight the alphabet such as fruits, vegetables, colors, animals, the ocean, or flowers. Counting books come in all sizes and shapes. Beginning counting books often provide fun illustrations of everyday items and objects that feature the numbers from 1-5 or 1-10. More elaborate counting books count to one hundred or a thousand and use a theme in presenting their information. Counting books for young children are important because they introduce the language associated with numbers. They also help preschoolers begin to understand the concept that numbers are symbols for counting, just as letters are symbols for sounds and word. Rhyming storybooks are a great choice for young children. They benefit from hearing rhyming language and repetitive sounds. Rhyming stories are fun for parents to read and provide lots of opportunities to read with emotion and to change the loudness and softness of the voice. Hearing stories that contain rhymes prepare children for reading by helping them focus on the sounds in words. Informational books are non-fiction and are written about topics that children have a natural interest in such as animals, food, vehicles, sports, or seasons of the year. Some informational books also label the illustrations in the book, helping to introduce written language to children. They are usually simple in style and focus on objects and subjects that are familiar to the children's environment.